As several readers have already noted, these things sold out very quickly – in less than 15 minutes! Big thanks to Basic Micro! If you have been considering the purchase of a Basic ATOM Nano product, but you weren’t quite ready to lay down the cash for a dev board and Nano microcontroller, boy to we have a deal for you. 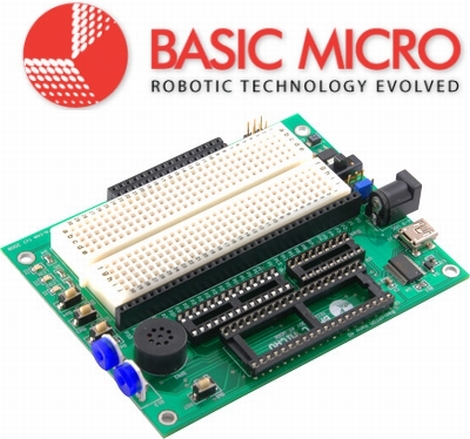 The kind folks at Basic Micro informed us that they have 55 Basic ATOM Nano Development boards, complete with Nano 28 microcontrollers that they would like to give away to the Hack a Day community for the low, low cost of $0. That’s right. Zero. Zip. Zilch. The dev boards come complete with an LCD header, a small solderless breadboard, USB connectivity, a pair of servo connectors, and more! The Nano 28 is based on the PIC16F886 microcontroller, and features an 8MHz clock, 24 I/O pins, 14K of flash memory, 368 bytes of memory, and 256 bytes of EEPROM storage. The total value of the package is just around $50, so this is an incredible deal! Basic Micro will even ship your kit to you for free via USPS. Just add this item to your shopping cart on the Basic Micro site, and use the coupon code “freehack” at checkout – they’ll take care of the rest. 2) The offer is limited to one kit per individual. Let’s not be greedy here, give your fellow hackers a chance at this deal as well. 3) Once these dev boards are sold out, they are gone for good. There are no rain checks or back orders available. *Not really, but it would be pretty cool if you did. Nice! I just ordered mine! Thank you HaD and Basic Micro! I like how they wait until after collecting your email and setting up your account to give you the “out of stock” message…classy! Now that didn’t last long. I got all psyched and then _ gone _. Granted there were only 55 of them. Wow. That was fast. Squeaked one in there. Can’t wait to see it! Grand total of 13 minutes from post to sell out. Wow, fast. Grr. Okay, which one of you got 37 of them? Added to cart successfully, entered coupon successfully, entered contact inormation/created account successfully, hit “place order” and… out of stock. Disappointing to see they don’t use a “place in line” ordering system, glad I used a throwaway email account. Got One!! I have been working on an integrated game for my and friends and I while in the pub. I haven’t had any extra jak so this works nicely + with the LCD header this is just what I have been looking for… saw small UPS in the garbage today it had a serial connection… I took it apart to realize it didn’t have a separate micro it was one main board. Didn’t want to mess with that kinda voltage. I will disclose my results but not anytime soon… School work and side gigs. Thank you! I am so excited to build something since I used my gadget budget on a dev kit for my nephew. ahw, they don’t ship to holland.. Remember, this is the dev board ONLY! It does not come with the Atom Nano uC. Actually the Nano 28 uC is included, it just was not listed on the item’s page. Not correct. Read the description. It comes with an Nano 28. In the HaD post they said it comes with the uC, so I would assume hope Basic Micro will add it to the orders. Dang! Glad I was wrong about the uC not being included. Thanks for pointing that out. No worries! I just didn’t want people thinking they had to run out and buy a uC as well. Now I’m really bummed I didn’t get one. I was hoping to use this as a basis for my son’s Boy Scout Robot. This is a lot cheaper than a Mindstorm and looks simpler to program than an Arduino. Maybe next time. I’ll probably end up buying the other components anyway as it still is cheaper than the others. man missed mine, it was just 4 hrs ago, there’s always a next time, thank you Dave, thank you Basic Micro. my apologies, I meant Dale. damn its a bummer they dont ship to alaska. Why doesn’t the website have a add to wish list and notify when it is back in stock? I got mine in the mail today. I’ll be working with it soon. I got mine in the mail, but I don’t know what to do with it… I was hoping to use this board to sort of get started as a hacking newbie. Where can I find some info? ondrejtoral liked VT-69 Handheld Terminal. Nicolas Tremblay liked pcbtc (GaN edition). castvee8 wrote a comment on Vacuum tube single digit calculator. Scott Devitt liked RC FPV tank rover. Robert Derr liked pcbtc (GaN edition).